Preventic Tick collar is a full proof protection against ticks within 48 hours of attachment. Just within 24 hours, it controls 92 % of tick infestation and protects dogs from harmful diseases. 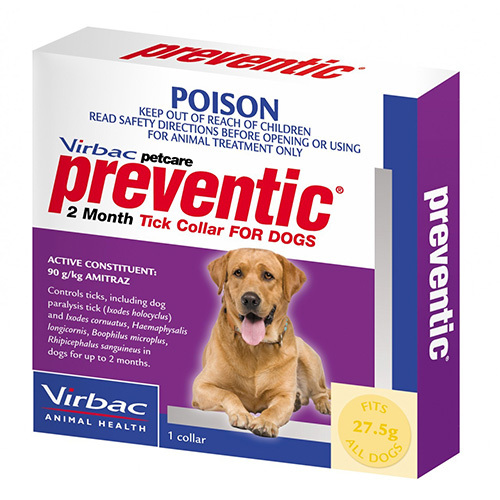 Preventic Tick collar controls ticks on dogs for up to 2 months. The collar prevents tick-borne diseases such as Lyme disease, babesiosis and rickettsia. The tick collar is odorless and trusted by vets. It is recommended for dogs from 16 weeks of age. Preventic collar contains active ingredient amitraz. An antiparasitic drug, it effectively repels and prevents ticks on dogs. Amitraz rapidly paralyzes tick mouth parts to prevent feeding and eventually kills them, preventing attachment of the tick and transmission of the disease. Preventic Tick Collar controls external parasites such as ticks, mites, lice and other animal pests. It’s mainly effective in controlling paralysis ticks, brown dog ticks, cattle ticks and bush ticks. Tie the collar on dog’s neck leaving 2 or 3 fingers space between collar and the dog’s neck. Do not tie the collar too tightly to the neck as it may irritate the skin. Cut off and dispose of any excess length of the collar. Once tied, do not remove Preventic, since the continuous dosage of Amitraz will be interrupted. Remove the collar while bathing or swimming. It is recommended for dogs 16 weeks of age. Every 8 weeks, reapply a new Preventic collar. Preventic Tick Collar is a smart option to kill and prevent ticks on dogs. It is an easy to wear topical preventive for protecting dogs from tick infestation. The collar destroys ticks carrying tick-borne diseases such as Lyme diseases. It is safe to use in puppies over 3 months and above. Within 48 hours, it is fully effective in controlling ticks. Check safety precautions on the package. Store package of this product in a cool place. Accidently, if the collar is chewed, immediately seek vet’s advice. Killed all the ticks on my pet's coat. I buy these every year! I get these year after year for my dogs, because it's so effective! I combine the dogs wearing these with treating my backyard with garden safe insect Killers and now I have maybe seen a couple of ticks on them where as earlier we'd see multiple ticks on a daily basis. I live in a bushy area where there are lots of ticks. Hence, there was always a need for a product that would protect my furry pals from these pesky parasites. My friend suggested me to get this collar and since then there has never been a single tick on them. Thank you so much!!! This collar works amazingly well. I reside in an area with a lot of deer. Before applying this collar there were 5 or more ticks on my furry pal's body at a time. But since applying this collar the ticks have gone. Great product!!! Will buy it again!! !